Billy West is one of our favourite tribute artistes - not just because of the quality and accuracy of his performance as a Freddie Mercury Tribute but also because he's a pleasure to work with. Billy always goes the extra mile to make his clients happy. He also constantly works on his act - perfecting his skills, enabling him to maintain his position as one of the best Freddie Mercury tributes in the market. Billy's show is fully produced utilising state of the art equipment and his props and costumes are also first class. Unusually for Freddie tributes, Billy sings in the same key as Mr Mercury himself - as a Freddie fan, you'll know how impressive that actually is. If you love Freddie, you'll love Billy. Check availability and get an instant quote just by filling in your details. Don't forget to use the Shortlist tool if you want quotes for multiple acts - you'll only need to fill out the form once. Billy West, as Freddie Mercury, is a true professional and crowd pleasing class act. His performance as Freddie is indeed a Tribute to the late star bringing him back to life...In Billy Freddie certainly can Live Forever...thank you Billy for such a great evening enjoyed by all. Billy West has performed at a few of our hotels. He puts on a fantastic show and our guests are always well entertained and pleased. Billy performed for us at our excellence awards ceremony. What a fantastic night we hold these awards regularly and billy was by far the best artist we have had what a voice and what a performer. Billy has played at the Tavern for the past 4 years. He always does our local herring queen festival and year after year it just gets better and busier. Billy has been at our club for over 4 years now we are always sold out and he just gets better and better we always look forward to his performances. We booked billy to perform for my fathers 60th birthday we were told how much he looked like Freddie but his resemblance was fantastic we all enjoyed the show my father in particular big Freddie fan he literally took his breath away. Billy did our presentation night it was a great show and Billy is fantastic as Freddie mercury he had the audience on their feet shouting for more. Billy performed at our wedding reception and having seen Billy twice before i knew he would be great his overall performance of Freddie mercury is nothing short of exceptional all our guests had a great time and we had a wonderful day. Billy performed at our annual gala he was excellent as Freddie and extremely professional he entertained everyone and we all had a great night. 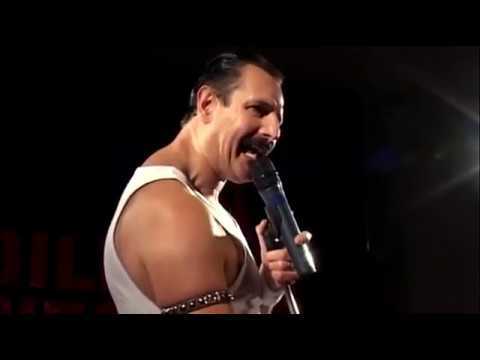 Billy did a show for us at our cricket club it was a fantastic night we sold all the tickets before they were printed he is the ultimate Freddie Mercury impersonator he had the audience on their feet and shouting for more. What a fantastic night everyone thoroughly enjoyed the show and billy west as Freddie Mercury leaves no doubt that he is the one and only Freddie Mercury tribute he is the best. We picked the right choice with Billy West he is a fantastic artiste with a great voice everyone thoroughly enjoyed the show and he had the audience in the palm of his hand what a professional. Billy played at our wedding and all the guests had a great time he is a fantastic Freddie and his performance was great we will certainly recommend him. Billy did 2 shows for us he was very professional and our audience loved the show he made sure they all fully participated a great night was had by all.